Well this day did not go as planned. It’s the first day of the year and I was going to do all kinds of things like go to church, finish a project I’m crocheting, paint, draw, organize……. but I couldn’t even get out of bed until around 6 pm. 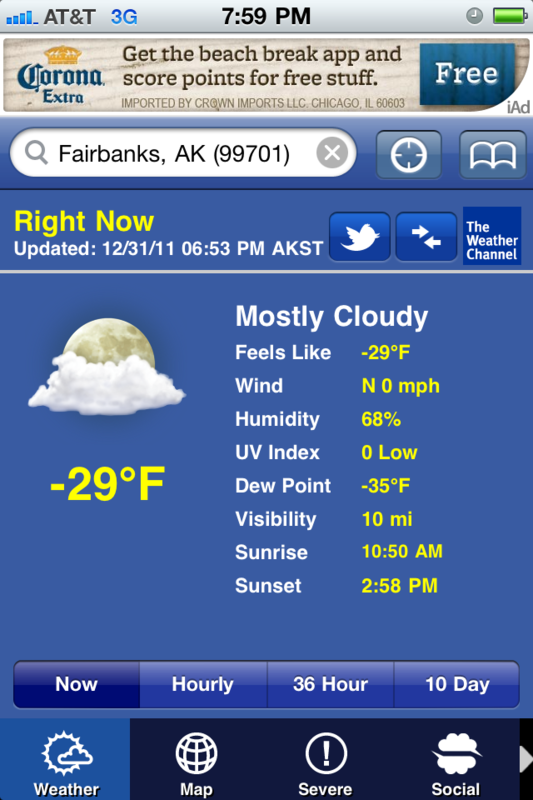 I am sure it was the cold from yesterday. 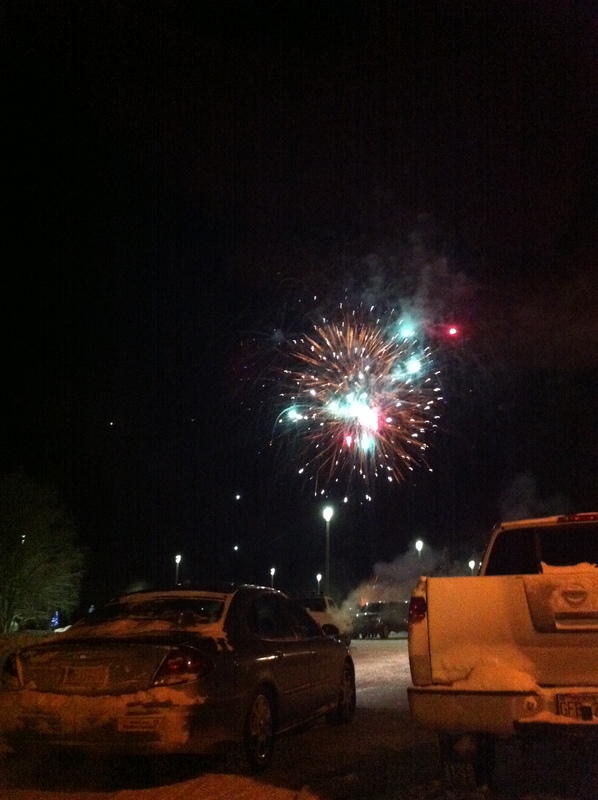 Riley wanted to go watch the fireworks at UAF. It is really cold here right now but we went. When it is this cold you can’t keep the car warm inside. The cold air just creeps in. If you turn off the air circulation in the car it will get warmer but the windows fog up and that makes driving difficult… plus, people would think we were making out with a kid in the car. Awkward. My oldest didn’t want to go so we just left him at home. There was a LOT of traffic! At first we got a really sweet spot parked right across the road from where they were shooting off the fireworks. My car has a moon roof so Riley was in the back seat watching the fireworks through that window. Then we noticed that the fuel light was on. We knew we had a half a tank of gas but the car was sitting at an angel at the side of the road. It was way too cold to risk having the car die so we pulled out of that spot which I’m sure was quickly taken. 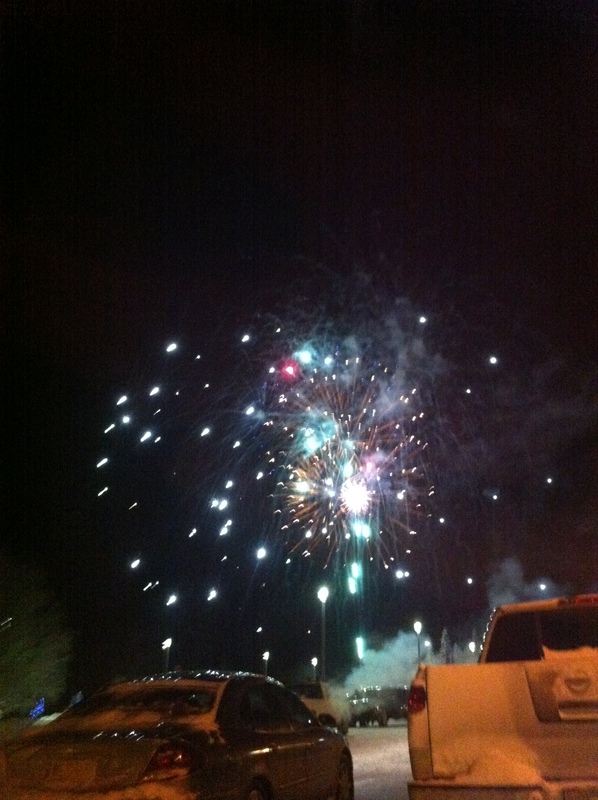 There were cars lining both sides of the roads and even along the exits and anywhere you could see the fireworks from. As soon as we got flat again the fuel light went off and the needle moved up to show we actually had gas. *phew* We ended up driving away from that area (since we thought we were going to have to go get gas) and then we turned and drove up the hill and around the back of the university. We ended up finding this even better spot where we could see the fireworks up close. Up on top of the hill they looked even bigger and we didn’t have to crane our necks to look up. The only bad thing was there were lights all over the place that made taking pictures hard. I wasn’t able to get many good pictures anyway since all I had was my iphone. Riley usually wants the camera to take pictures but right away he realized it was impossible to get a good shot. He really enjoyed the show though. After the fireworks ended we went to eat at Brewsters. Everyone was cold and wanted something warm in their belly’s. Usually we would go to Denny’s but they were closed! Brewsters has great hamburgers! After that we stopped by Safeway and were surprised that they closed too. These are places that are always open… even on Christmas. So we just filled up the gas tank and went home. One of the things I plan on doing this year is cleaning up my garage. It is full of stuff that I need to go through. Some of it is boxes from when we moved in 2004! That last couple days I had been bringing out a box or two to sort through and I found this old planner from 2004. I used to use these specific planners all the time since they were small and easily fit in my purse. By the end of the year they would be bulging with sticky notes, receipts, and other odd pieces of paper. I actually tapped an index card to one of the flaps to act as a pocket for things. 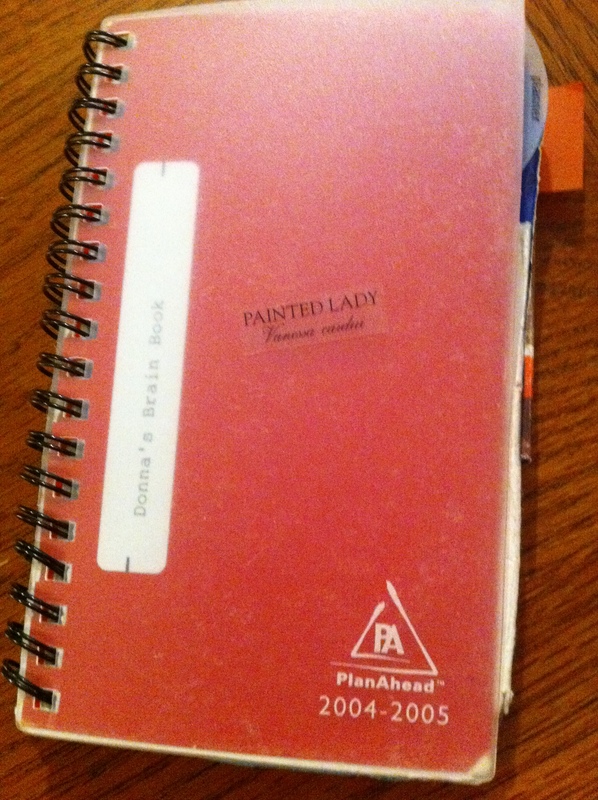 The white label says “Donna’s Brain book” since without it I couldn’t remember a thing! Now of course I have my iphone but I miss having these little planners to write in. It is always interesting to look back at the end of the year and see all the things I’d already forgotten about. Just seeing an appointment for a dentist appointment for one of my boys would take me back to that time and I remembered the tears and talking them through it. So many years have passed since then and now there are no more tears. My boys are so big. I never would have thought I’d miss those frustrating moments but those were moments when they needed me. They don’t really need me anymore. It makes me think of that song by Trace Adkins…. This song always makes me cry because it makes me think of all the times I had to spend with my mom before she died. All the time when I had too many other things to do. And I do…. miss that. We don’t do fireworks here. Wow! Seems too cold to do them when it’s 30 below! They did look nice, though. Quite a song! Having Dagan and living one day at a time has always been such a blessing. It forced me to stay in the present moment and to be aware of all the little moments. Put such a different perspective on life, I guess. Made me remember to keep in touch with the people I didn’t want to lose and kept me grateful for each day so that it became a habit. And I would become nostalgic before I ever moved (and I moved a lot) or before Dagan reached another milestone growing up. Sure there are lots of times we take our lives and the lives of those we love for granted…but I try not to let much time go by before I remember. Having a child they tell you is not going to live was such a gift. Sometimes I can’t believe he is still here. 🙂 God has been very generous.